What Ken Be Done? : Day 184/365: Do a deer! Done a deer! Day 184/365: Do a deer! Done a deer! Personally, I don't think the deer is frightened of my garish outfit, its just turning to face the LiP to be part of my blog post today! Say, "Cheese!" I've started reading Osamu Tezuka's 8-part comic on the life of Buddha, and thought therefore it might well be time to return to Nara and see the Daibutsu Great Buddha (which is one of the largest bronze Buddha statues in the world and it's situated inside the Todai-ji Hall, the largest wooden building in the world). My favourite fact is the Buddha's ears are 2.5m long! 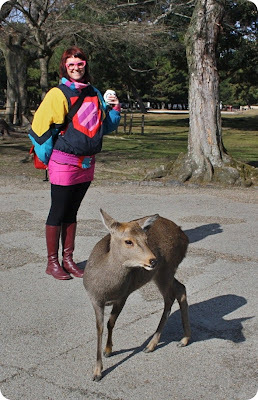 The photo with the deer is because these animals are now "national treasures" in Nara, and are allowed to roam free. And what do you get when you cross Buddha with a deer? Sento-kun, a cool little comic mascot who has been designed to celebrate the 1300th anniversary of Nara. Now my Ken Done skirt today isn't quite depicting Sento-kun, but it does nicely pay comic-style homage to Australia's beach culture through a rather wonderful female character. And I just *love* that I wore what is essentially an over-the-bathers skirt in winter in Japan! (Pattern seem familiar? See also Day 170/365 and Day 146/365). That deer is a genius. 10 gold stars to the LiP for the best photo ever taken. ....A t-shirt... and then bathers.... in Japan..... in winter.... brave!